Mistreatment by police, judges and landlords. Longstanding treaty violations. A staggering dropout rate among Indian youth from the public schools. The meeting was called by Dennis Banks, George Mitchell, Harold Goodsky, Annette Oshie, Florence Holmes and Clyde Bellecourt. Bellecourt, then employed as an engineer at a power plant, was elected chair of the new organization that became the American Indian Movement. Soon, AIM chapters sprouted in cities and reservations across the United States. The group earned worldwide attention for its 1972 occupation of the Bureau of Indian Affairs headquarters in Washington and the 1973 armed standoff at Wounded Knee, S.D. Its role in establishing several enduring Indian-focused institutions is less well-known. Now, 43 years after AIM’s first meeting, some of the old guard and others who embrace its legacy want to create an interpretive center to tell the movement’s story. “If we don’t tell it, Garrison Keillor or some other non-Indian will tell it,” says Bellecourt, 75, with a smile, admitting he has nothing against Keillor. 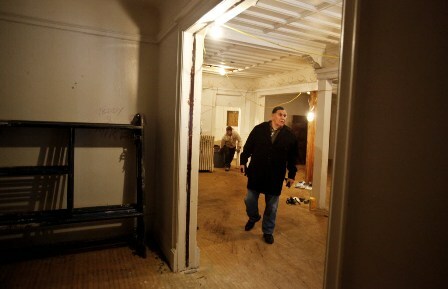 The American Indian Movement Interpretive Center would be housed in a vacant 19th century mansion at 1208 5th St. SE. once owned by lumberman Henry Frey. More recently, the mansion was used for auxiliary classroom space by the Heart of the Earth Survival School, which was in a separate building across the street. Heart of the Earth shut down in 2008 after its executive director embezzled more than $1 million from the school. The school building was sold and razed and the $1.2 million in proceeds are being used to advance the interpretive center project. The center would have interactive exhibits and archival material including photos, video and audio and a place for youths and elders to gather. It also would serve as a resource for students at the University of Minnesota. The center has already hired the architectural team of Karen Gjerstad and Robert Roscoe and a work crew to begin renovation of the Frey mansion. An office for the project has been opened nearby.Comment: For more on AIM, see Means Receives Lifetime Achievement Award and Occupy Denver Joins Columbus Protest. "Mistreatment by police, judges and landlords. Longstanding treaty violations. A staggering dropout rate among Indian youth from the public schools." The first are injustices. The last part are bad decisions made by individuals. Decisions no one forces anyone to make.